Sometimes, when selling a great amount of things at a single village, it takes way too many clicks to Select, move cursor and hit "Sell", and repeat for each highlighted item in the inventory. A "Sell All" would make trading a little more agile, selling all the highlighted items in one click. If a button like this makes things "too easy", another possible workaround is to allow a highlighted item to be sold by double-clicking on it instead. This way, the process would not be fully automated and not a complete pain at the same time. note: buying already made easy now cooldown timer is almost gone and I think for selling too. it's already easy like 5 times than before. I actually like the suggestion. RISE wrote: note: buying already made easy now cooldown timer is almost gone and I think for selling too. it's already easy like 5 times than before. I don't really know how it was before, I play in the server for like 3 weeks now. Wait, there's a cooldown? Amy Michaels wrote: I actually like the suggestion. Maybe instead of Double-click, make it x3 Times click in case if someones want to just cross check whether they want to sell or not. 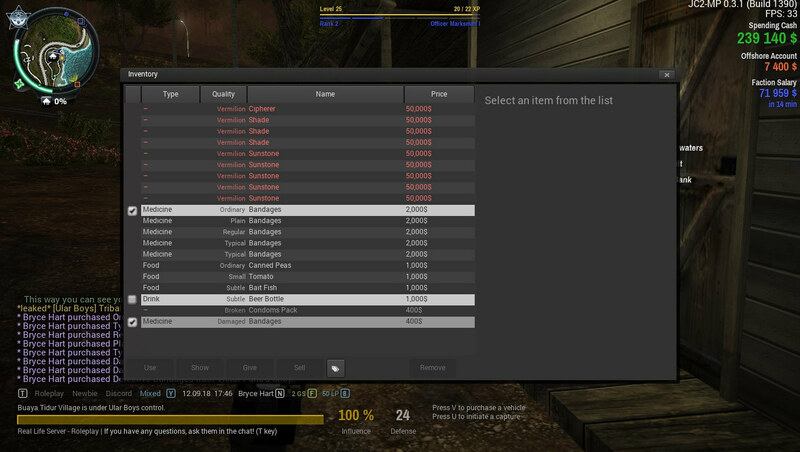 ...Or let the tradable items be marked with checkboxes and sold by the Sell button, like this. Should all tradable items start selected? I don't know, maybe. Let's hear what people think about it. Or if it's possible an other mechanic can be implemented, like buying guns, you can select items that you want to sell then press sell and woilla it sells items which you selected one by one. Bryce Hart wrote: ...Or let the tradable items be marked with checkboxes and sold by the Sell button, like this.